A planned Hyde Park Village Family Fun Day for Sunday, 21st June, was postponed after flooding throughout the Te Horo and Otaki areas. Many stall owners were unable to reach Hyde Park due to road closures or flooding on their properties, and shops in the centre were also awash with mud and water. The fundraising venture which included family-themed activities, sausage sizzle and face painting, was aimed at gathering funds for a children’s playground at the Village, and took place the following Sunday. The recent Te Horo Hall AGM resulted in the election of a new committee, including Sharon Hurst as Chair, Tina Doyle, Secretary, Janet Rosedale, Treasurer, and members, Barbara Chatters, Alex Kelly, Jenny Gordon, Andy Johnson, Neil MacInnes, Sue Brickell and Alan Lancaster. Outgoing Chair, Alex Kelly, expressed huge thanks on behalf of the committee and community to members stepping down — Michelle Papps, Don McGregor and also Peter Rahr, who had served a lengthy period as committee Secretary. To recognise his immense contributions to both the committee and the Te Horo community, Mr Rahr was made a Life Member of the Te Horo Hall Society. 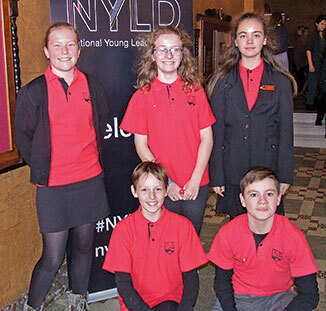 Te Horo School sent five year 8 students (pictured below) to the recent 2015 National Young Leaders Day in Palmerston North. The programme is the largest and longest running leadership event for primary, intermediate and secondary school students, and aims to stimulate young people through practical, inspirational events and leadership resources. It’s never too cold to exercise — try out Carola’s regular Swiss Ball classes at Te Horo Hall, Tuesday, 9.15am – 10.15am. Call Carola 021 060 6094 for details. 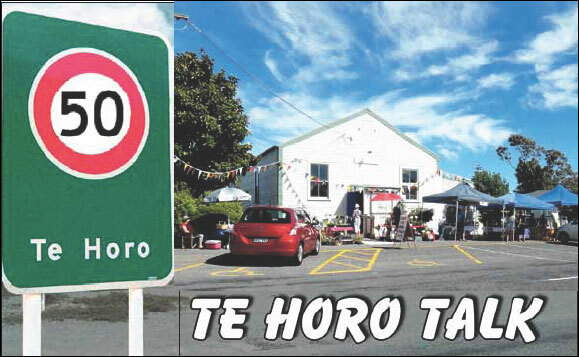 Te Horo’s community-based monthly market, featuring fresh seasonal produce and preserves, home baking, flower bunches from nearby Te Horo Ornamentals, garden plants and seedlings, jewellery, handcrafts — Sunday, 5 July, 10.00am till12.30pm, wet or fine, Te Horo Hall. Meeting Wednesday, 8 July, 10.00am onwards at Te Horo Hall – pop in with whatever you’re currently working on. No membership required. Get together with your neighbours, old and new – BYO drinks and a plate of nibbles to share. Friday, 3 July, 5.30pm at Te Horo Hall. Previous articleThe NZ Blood Service needs your help!